Perhaps it was beginners luck. I finally attempted to make Macarons and I would not have been successful or even willing to try without my friend Ellen. I met Ellen through Zack and boy am I glad that I did. She loves baking and cooking just as much as I do and she is great at it! First she and I made cinnamon buns right after Christmas (don't worry I will post those soon enough), then weI made Irish Car Bomb Cupcake and White Russian Cupcakes for NYE (those will also be shared with you). 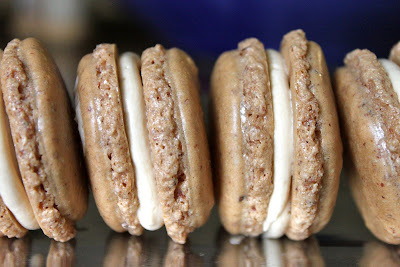 We were so successful with both those items that we decided to attempt Macarons together. I have put off making Macarons for this long because all I have heard is that they are really difficult to make. Ellen inspires me to bake new things and with her no fear attitude we set a date. Both Ellen and I read quite a bit on how to be successful making Macarons and it paid off. They turned out perfectly! 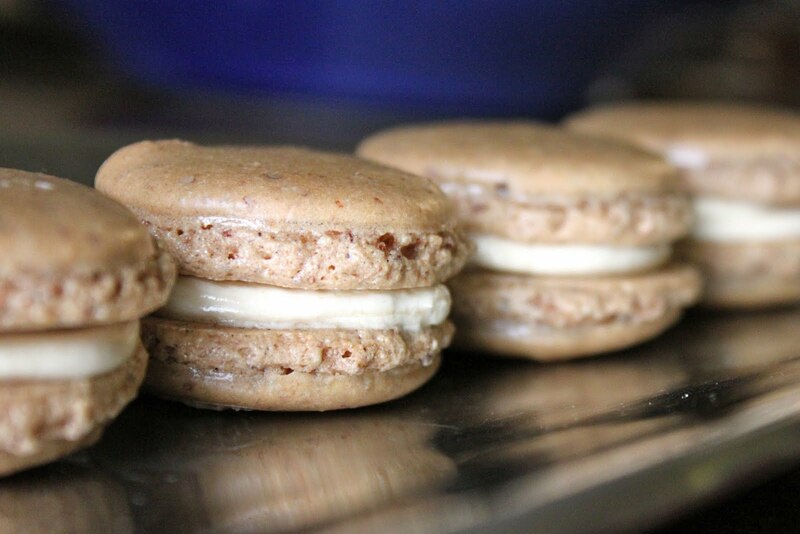 We made two types: Vanilla Bean Macarons with a Raspberry Mascarpone filling and Chocolate Espresso Macarons with a Caramel Buttercream filling. I have never had Macarons in Paris, but Ellen has had many there and thought ours were just as good if not better. She actually said in regards to the Chocolate Espresso Macarons "This may be the best dessert I have ever had." Coming from Ellen that means a lot! The Macarons were really not as scary or difficult as I thought they would be. Below are a few tips that I think will help you. 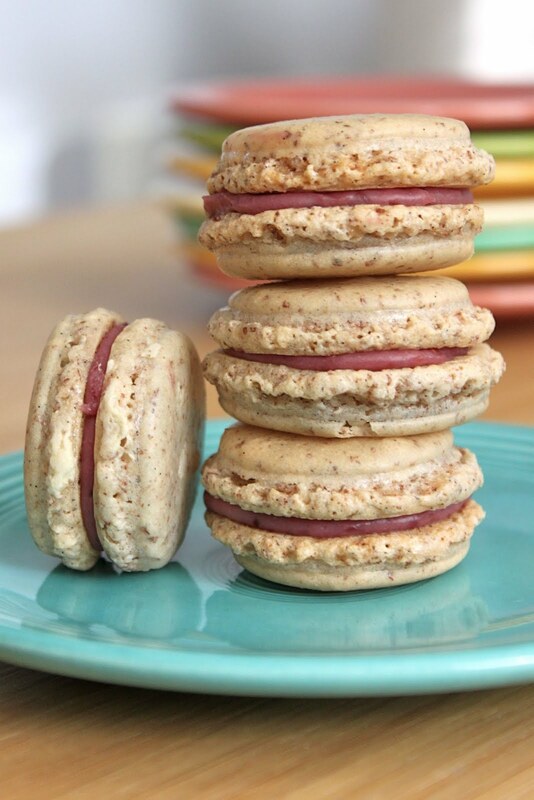 For more detailed information on perfection Macarons visit Tartlette's website. 1) You need a kitchen scale, food processor, parchment paper, a large piping tip, and preferably a stand mixer. 2) Separate your egg whites 3 days in advance and leave them in a container in the fridge. 3) Measure all your ingredients and prepare your baking sheets in advance. 4) Don't be afraid to fail. In a stand mixer fitted with the whisk attachment, white the egg whites to a foam. Gradually add the granulated sugar until you obtain a glossy meringue. Do not over bear your meringue or it will be too dry. Place the powdered sugar, almond meal, and beans of the vanilla bean in a food processor and pulse until well mixed. Add them to the meringue, give it a quick fold to break some of the air and then fold the mass carefully until you obtain a batter that falls back on itself after counting to 10. Give quick strokes at first and then slow down. The batter should fall back on itself and flatten. Fill a pastry bag with a plain tip (I used an Ateco #809) with the batter and pipe small rounds (1 in in diameter, as they will spread) onto parchment paper or silicone mats lined baking sheets. 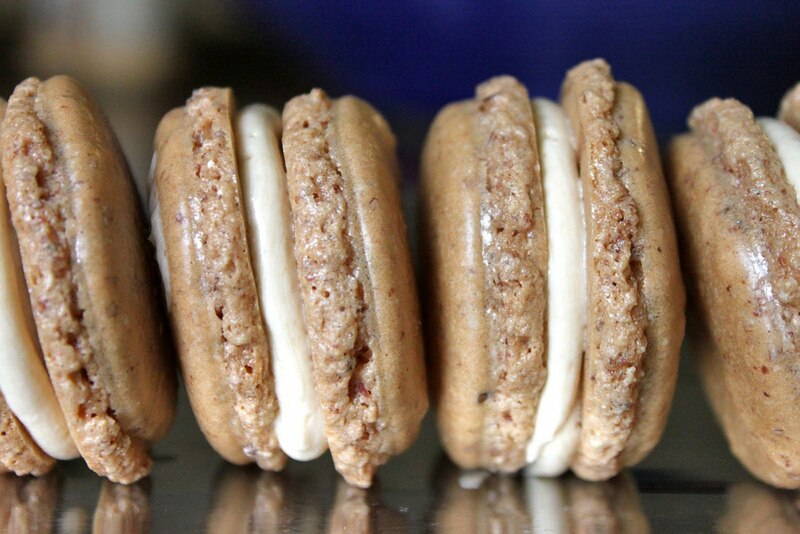 let the macarons sit out for 30 minutes to an hour to harden their shells a bit. Preheat the oven to 300 degrees Fahrenheit and bake for 20 minutes. Let cool completely before filling. In a small bowl, whisk together the mascarpone and preserves together until well incorporated. Fill a small piping bag with the filling and pipe it in the center of each shell. Store macarons in the fridge. In a stand mixer fitted with the whisk attachment, white the egg whites to a foam. Gradually add the granulated sugar until you obtain a glossy meringue. Do not over bear your meringue or it will be too dry. Place the powdered sugar, almond meal, the espresso powder and cocoa powder in a food processor and pulse until well mixed. Add them to the meringue, give it a quick fold to break some of the air and then fold the mass carefully until you obtain a batter that falls back on itself after counting to 10. Give quick strokes at first and then slow down. The batter should fall back on itself and flatten. Fill a pastry bag with a plain tip (I used an Ateco #809) with the batter and pipe small rounds (1 in in diameter, as they will spread) onto parchment paper or silicone mats lined baking sheets. 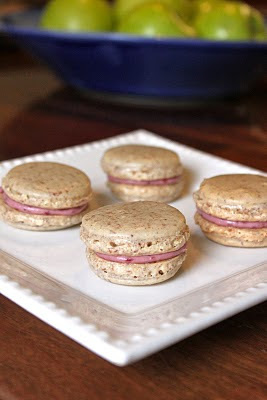 let the macarons sit out for 30 minutes to an hour to harden their shells a bit. Preheat the oven to 300 degrees Fahrenheit and bake for 20 minutes. Let cool completely before filling.